Craig Brown, who had a similar role with Derby County, believes Rangers have made a good move by appointing Gordon Smith as director of football. 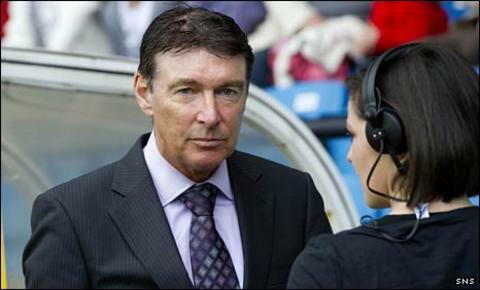 Smith resigned in 2010 after three years as Scottish Football Association chief executive. Now he will work alongside Rangers manager Ally McCoist. "I think it would be a big advantage because both would be personally friendly, so that is an ideal scenario," said Aberdeen manager Brown. "There is a great deal of diplomacy involved in that role. "Some managers, I would imagine, see the director of football as a threat." Brown recalled as an example Dave Bassett's departure from Leicester City after the arrival of present Scotland coach Craig Levein as manager. However, Brown thought his own time as Derby's "football consultant" and his present relationship with Willie Miller at Aberdeen show that the role can work as long as there is no conflict between the individuals involved. "Willie Miller here is in charge of recruitment," explained Brown. "He is in charge of the whole youth set-up at Aberdeen. "If I request any information about scouting, Willie will provide that information from one of the scouts. He co-ordinates all that. "He never at any time presumes to pick the first team or advise unless asked and I've got to say he does the job brilliantly. "Willie, for all the fact that he is a legend up here in Aberdeen, he keeps a low profile and is totally and utterly supportive." Brown said that his own job description was different at Derby and that Rangers would have their individual definition. "The job was to protect the manager from agents and be in charge of the scouting for the club and deal with hiring and firing," he said. "There was also talking to sponsors and I would imagine that Gordon Smith is ideal for that kind of role." Smith was criticised in some quarters for the appointment of George Burley as Scotland manager and for his handling of the bans given to Rangers players Barry Ferguson and Allan McGregor following a late-night drinking session. It was only after he was succeeded by Stewart Regan that Smith's promised reform of the SFA became a reality. However, former Celtic assistant Murdo MacLeod thinks that his fellow BBC Scotland football pundit would be ideal for the role at Ibrox, having also previously been a player, coach and football agent. "Gordon's got the tools. He knows what is needed to bring in players, he has the contacts and he knows how to pick out a football player," said MacLeod. The former Scotland midfielder recalled that he had a negative experience at Celtic when Jock Brown replaced Davie Hay as general manager at Celtic, with he and manager Wim Jansen being out of a job within a year. MacLeod thought a personality clash was the problem but said of the Rangers roles: "This will be a good relationship. "The most important thing in football is trust and I think Ally will get on with Gordon because they have been pals for many years. "I think Gordon will do well. Obviously, it depends on what tools he is given to go and do the job. "He will be overseeing transfers and the youth development at Rangers, but it depends on how much money he will be given to spend."